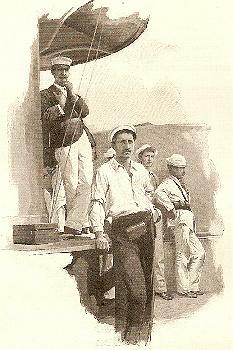 Chief Yeoman George H. Ellis of the BROOKLYN was the only American sailor killed in the naval Battle of Santiago. George Henry Ellis was born in Peoria Illinois on October 26, 1875. While still a young boy, he moved with his mother to New York City. Later, in about 1890, Ellis moved to Brooklyn. After working briefly for J. Paul Burton, a publisher on Duane Street, Ellis joined the U.S. Navy on February 26, 1892 as an apprentice at the age of 16. During his term of service, he served aboard the MONONGAHELA, possibly the MINNEAPOLIS, the CHICAGO and the COLUMBIA. He was discharged on October 25,1896 (some source indicate 1897). While still aboard the COLUMBIA, George Ellis married Sadie M. Simonson. After the wedding and leaving the Navy, he and his wife lived at 819 Dean Street at Bull’s Head, Staten Island. The Ellis' were active members of the Washington Avenue Baptist Church. After a few months, Ellis rejoined the Navy as a seaman, but was assigned to the DOLPHIN as a Yeoman First Class. In an ironic twist, he was eventually transferred to the BROOKLYN, named for his adopted hometown, with the rank of Chief Yeoman. Aboard the BROOKLYN, Ellis was well-liked. He was described as “clean cut” and who spoke out about his belief in God and strong ties to his church. On June 30, 1898, while the BROOKLYN lay off the entrance to Santiago harbor as part of the blockade, he received a large number of Bible tracts sent to him by the Sunday School of the church he and is wife attended. He passed these out to members of the crew. He frequently commented on the fact that there was no chaplain aboard and that no Sunday services could be held aboard ship. The following day, he took the opportunity to show reporter George Graham a photo of his wife and seven month old son. Shortly, it was discovered that the Spanish squadron was steaming out of the harbor. The Battle of Santiago was on. Chief Yeoman Ellis reported to his battle station, which was on the foc’s’le where he operated the stadimeter, which was used to determine the range to a target. At this time, range for the guns as well as for navigation was determined by one man, in this case Ellis, and the data sent by messenger to the gun crews or elsewhere as needed. Ellis had performed this duty, which was hazardous as he was exposed on deck, in battle on at least six occasions when the BROOKLYN took part in bombardments of fortifications on the Cuban coast. It was later described that Ellis would stand out on the foc’s’le with a watch in one hand and the stadimeter in the other, with a notebook tucked in his belt to record data on the fall of the shot. In the actions, he had “become used to the shrieking of shells and the splashing of projectiles as they fell near the ship and the dull thud as one would strike the high superstructure or the tall stack” as he unprotected facing the guns of the enemy. Now, as the BROOKLYN chased the fleeing VIZCAYA and CRISTOBAL COLON, Ellis reported that the range between the BROOKLYN and the fleeing vessel was remaining constant. Ellis went forward with his stadimeter to again verify this, when a shell from the VIZCAYA hit him in the face, decapitating him. Ellis was the only American sailor killed in the battle. In shock from seeing Ellis’ gruesome death and operating on standard procedure, Ensign McCauley and Dr. DeValim picked up the body and prepared to toss it overboard. Commodore Schley saw what was happening and ordered the men to stop. He said “No! Do not throw that body overboard! One who has fought so gallantly deserves the honors of a Christian burial.” The body was covered and placed beside the forward turret. Following the battle, Yeoman Ellis was buried beside the fallen marines at Camp McCalla at Guantanamo. Initially, there was an effort in his hometown of Peoria, Illinois to have the body returned there, but the plans fell through. However, he was eventually disinterred and his body returned to Brooklyn aboard the Hospital Ship SOLACE, arriving on November 22. The body had been placed in a hermetically sealed casket. In Brooklyn, Ellis’ brother-in-law, J. W. Sawyer took charge of the body, taking it to his home at 15 Greene Avenue where the funeral was held. In the interim, in early October, a memorial service had been held at the Washington Avenue Baptist Church. The church held two thousand people, and thousands had to be turned away for lack of space. Speakers at the memorial service included Commodore Jack Philip of the TEXAS, Captain Francis Cook of the BROOKLYN, New York Lieutenant Governor Timothy Woodruff and former mayor Charles Schieren. A framed portrait of Ellis was palace in front of the pulpit, and the church was decorated with plants and American flags. The service included the reading of a telegram of condolence from Secretary of the Navy John Long. Soon after Ellis death, a fund was started to provide an annuity to his wife, Sadie. By September, two thousand dollars had been raised, and efforts continued to increase his fund. In January of 1899, Sadie Ellis also began receiving a pension from the U.S. government. In an ironic twist, Sadie’s sister married one of Ellis’ friends from the Navy, George Harvey, who had served at the Battle of Manila Bay. Brooklyn Daily Eagle, May 17, 1901. Graham, George Edward, Schley at Santiago. (Chicago: W. B. McCokey, 1902) 311-312. Schley, Winfield Scott, Forty-Five Years Under the Flag. (New York: D. Appletoon and Co, 1904) 305.